When we think about film-making, many of us instantly picture glamorous actors in their red velvet gowns, of perhaps bearded, eccentric directors sitting in their little chairs on set, barking out orders as they munch on cheese burgers, or perhaps the bright lights and shiny Oscars of Hollywood. Yet, as Cecilia Wang (14SO6C) puts it, “film is much more than just a multi-billion dollar industry.” It is beauty captured behind a camera lens; it is a photograph that speaks, a poem that sings, a story that lives and breathes. Film marries the romance and beauty of words, poetry and story telling with the technical perfection and precision of camera angles, lighting, and frame by frame editing. Film is an art, a science, and a little bit of magic. This begs the question, what EXACTLY does the Raffles Film Society Do? 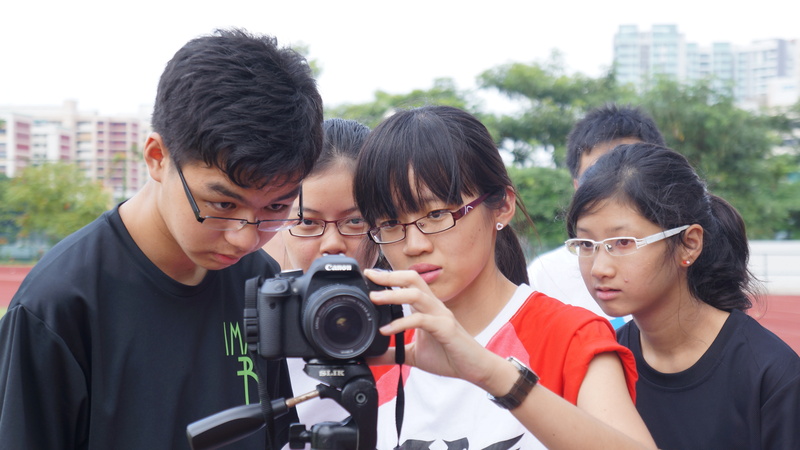 Besides creating original short films for our annual premiere at the Singapore Arts House and for the school’s Arts Fest, we also pride ourselves in producing top quality videos for various student and leadership bodies in the school. Film Society members are also given unique opportunities to take part in competitions on a national, regional and international scale (fully subsidised!) for which any outstanding achievements will be recognized in the Raffles Diploma Arts & Aesthetics domain. That’s not all! With the launch of our very own official YouTube channel in early 2014, fans of JKFilms, wahbanana, TheGRIMFILM, and other famous YouTube film-makers, will have their own shot at internet stardom. Of course, it’s hard to imagine that a couple of JC students with limited budget (though that’s about to change :D), non-professional equipment, and short, pathetic snatches of time between juggling hectic school schedules will be able to create anything that even remotely resembles a film. I have to admit that I, too, had my doubts when I first joined the CCA. But over the course of the year, I’ve come to realize that what makes a film good aren’t expensive lenses, high-tech editing software or highly paid professional actors. With heart, guts, and a passionate, never-say-die crew, films can be made with iPhone torchlights (light kit), Voice Memo apps (boom mike), roller chairs (dolly) and pizza (actor’s ‘salary’). Like all the other indie moviemakers out there, the Raffles Film Society is fuelled by the creativity, resourcefulness, initiative and camaraderie of its cast and crew. Making films from scratch, without money, actors or equipment isn’t easy. But trust me- it’s the most fun you’ll get amidst a hectic study schedule in JC. Bouncing ridiculous plot ideas off each other; drawing hideous storyboards together; take one, take two, take three, blooper after blooper; pummeling the idiot who sniggered while the cameras were still rolling; sharing earphones and listening to soundtracks in search of that perfect non-copyrighted song for the film; huddled around one computer, slogging through the final edits of a film together, each ‘cut’ a slash to the heart, taking that final bow as the final credits of the film starts rolling in the darkened theatre of the Singapore Arts House– there’s something intensely rewarding about all these little moments that make up the unique, unforgettable experience of creating a film. One unique aspect of the CCA is it’s amazing flexibility and mind-boggling possibilities- members can create films about whatever they choose, whenever they choose, however they choose, wherever they choose, and with whomever they choose. Aside from a weekly Friday training session with acclaimed Singaporean director Kevin Sng, there isn’t a fixed or rigid CCA schedule that must be followed. This gives members the freedom and space to make their films at their own pace and style. More than any other CCA, the Film Society allows members to develop their creativity, fortitude, dynamism and personal flair. As Ingmar Bergman puts it, “Film goes directly to our emotions, deep down into the dark rooms of our souls.” No other artistic medium touches human hearts the way film does. If you’re interested in telling good stories, making great films and forging even greater friendships, Film Society is the CCA for you! :) If you have any queries, feel free to message Hao Ran, the chair of Raffles Film Society, at 81025158.
we love the open house video!!!!! What are Film Society hours like? Are late night shoots and stuff common? The way Players have late night rehearsals closer to production….